This was an observational survey study administered to individuals over age 18 who identify themselves as having cluster headache. Patient perspectives on the use of placebo in cluster headache clinical trials were assessed using a paper-based survey. Participants were recruited during a national conference held for patients with cluster headaches (“Clusterbusters” in Austin, TX, September 2016). Informed consent was obtained and no identifiable data were collected. There is little knowledge about the natural course of cluster headache, especially the age, pattern and characteristics of remission. We screened patients who were diagnosed with CH in Samsung Medical Center between 1997 and 2010. 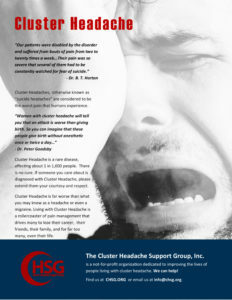 Chronic Cluster Headache (CCH) is the most severe and disabling primary headache. Studies using functional magnetic resonance imaging showed the ipsilateral posterior hypothalamus activation during the cluster headache episodes. The Deep Brain Stimulation (DBS) of the posterior hypothalamic area was introduced in 2000 in order to treat drug-resistant chronic cluster headache. This retrospective observational study analyzed claims data from the Truven Health Analytics MarketScan® Research Databases from 2009–2014. Two cohorts were compared: propensity-score (PS) matched CH and non-headache control patients. Eligible CH patients had ≥2 CH claims. All patients had continuous enrollment for ±12 months from date of first CH claim. Descriptive comparisons are presented. We screened patients with cluster headache who were diagnosed at Samsung Medical Center and lost to follow-up for ≥5 years. Eligible patients were interviewed by phone about the longitudinal changes in headache characteristics and disease course. Remission was defined as symptom-free 1) for longer than twice the longest between-bout period and 2) for ≥5 years. The sphenopalatine ganglion (SPG) plays a pivotal role in cluster headache (CH) pathophysiology as the major efferent parasympathetic relay. We evaluated the long-term effectiveness of SPG stimulation in medically refractory, chronic CH patients.